Subsequently, a meeting in San José on 30th October - involving SINTRAPEM, COSIBA (the Costa Rican banana and pineapple union coordinating body), COLSIBA (the Latin American banana and agro industrial union coordinating body), Banana Link, ANEXCO and Fyffes - did not achieve the real breakthrough that was needed to put an end to the anti-union activities. But ANEXCO and Fyffes did, however, agree to another meeting to review the list of the union's complaints, provisionally scheduled for 6th November. Last chance to sign the Make Fruit Fair petion! Thank you for supporting the Make Fruit Fair! petition. More than 46,000 people have signed so far. The petition is to be handed over to the European Commission on Monday 10 November. We are hoping to have reached 50,000 signatures by then, so if you have not already done so, please sign the petition before Tuesday. Over the past decade, the banana export industry has expanded significantly in the northern Piura-Sullana region of Peru, employing an estimated 6,000 workers. 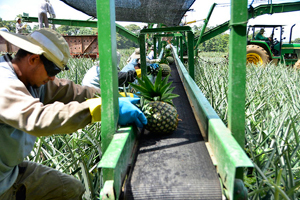 Spurred on by a government seeking to increase agroindustry exports with the aim of attracting foreign investment, workers' rights have been swept aside by flexible employment legislation and export laws that fail to protect banana workers. SITAG, the Peruvian Union of Agricultural Workers, has been attempting to organise men and women employed in the banana industry, and in spite of working in very difficult conditions, has won some successes. Union membership has increased, and SITAG has a significant presence in many of the banana-producing and exporting associations, including multinational DOLE-Peru. However, proposals for social dialogue and collective bargaining have been challenging to progress. Funding has been secured to strengthen SITAG with a programme of union representative training, a drive to increase participation by women and youth in the union, as well as legal and institutional support, with the aim of achieving a sector-wide collective bargaining agreement in Peruvian bananas by 2017. COLSIBA (Coordinating Body of Latin American Banana and Agro-industrial Unions) held its 13th General Assembly in July in Managua. Trade union delegates from eleven countries discussed the situation of workers in export agriculture in Central and South America and held elections. Iris Munguia was elected for the second time as Coordinator. A defender of women's rights and trade union activist for more than 30 years, she brings a wealth of experience on the challenges faced by women banana workers to the role. 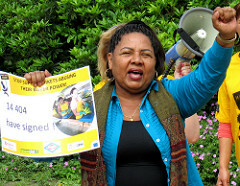 Iris worked for 23 years in a Honduran banana packhouse, has served as a trade union leader, was the first woman to be elected as COLSIBA coordinator in 2012, and that same year received international recognition for her struggle to support banana workers in Honduras when she won the SOLIDAR Silver Rose award. In our spring newsletter, we reported that FENACLE, our union partners in Ecuador, have been leading a project to empower women workers in the banana and sugar sectors by raising awareness of women's rights in the workplace and the important role they can play in trade union organisation and leadership. Educational workshops to more than 200 women workers and union representatives on the topics of leadership, self-esteem, organisation and empowerment of women within the trade union. 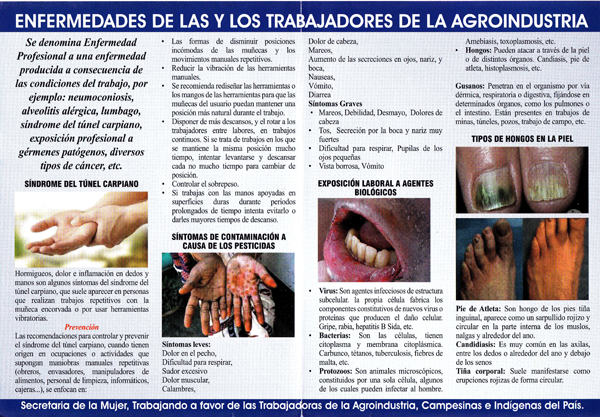 Distribution of leaflets outlining articles in the Ecuadorian labour code relevant to women's rights, to raise awareness of the need for gender clauses in the labour reform. Research conducted through plantation visits and interviews with women to help FENACLE identify and address their specific needs, including health and safety. The prospect of introducing more women in positions of leadership within the union looks ever more encouraging. Funding has recently been secured from the charitable foundation of UIA Insurance in partnership with the GMB trade union to support FENACLE's Women's Officer to carry out her invaluable work for 3 more years! 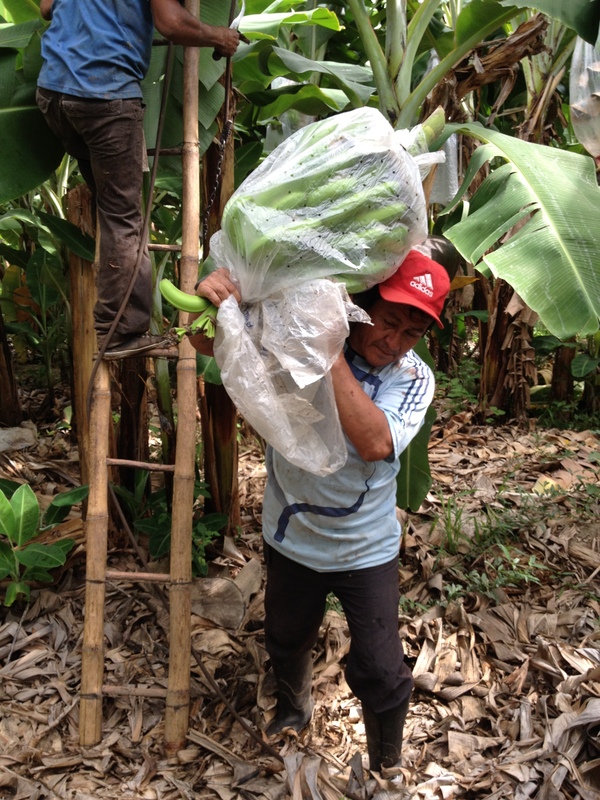 The second year of our TUC Aid funded project to support the organising and training of Guatemalan banana workers is enabling continued progress in the region. In the North, a new three-year Collective Bargaining Agreement was reached in June with a subsidiary of Del Monte, which includes decent wage increases, contributions to a housing fund for workers, and a one-off negotiating bonus to all workers. Union leadership attributes this success to an excellent negotiating team whose skills have been developed by regular training activities supported by TUC. The new agreement benefits 3300 employees! In the South, hostility towards trade unionism remains the norm, so informal education of workers rights, outside the workplace, is the only way to progress awareness. SITRABI continues to make efforts to connect with plantation workers, however, workers are often on temporary contracts, therefore limiting the longer-term organising potential. In July, a formal cooperation agreement was reached between SITRABI and an organisation of the Catholic Church. Although the work of Pastoral de la Tierra is focused on environmental issues, the scope of cooperation agreed covers the investigation of aerial spraying, agrochemical use and worker protection, as well as the environmental impact of the plantations on surrounding communities. SITRABI leaders are confident that this new relationship constitutes a significant step forward in the South. SITRABI is the oldest private sector union in Guatemala and represents over 4000 members in Del Monte and in Del Monte supplier farms on the Caribbean coast, and has good relations with other local unions in other multinational and national plantations. Noé was elected General Secretary of SITRABI in 2000, shortly after the union’s Executive Committee was forced at gun point to resign their posts and call off strike action over contract violations. Guatemala is the second most dangerous Latin American country in which to be a trade unionist, and SITRABI has been devastated by a series of assassinations since Noé's brother was killed in 2007. Since then, nine members of SITRABI have been murdered. None of the murders have been properly investigated by the authorities. Despite this, SITRABI has been successful in managing to maintain collective bargaining and workers have managed to secure many of the elements of 'Decent Work'. 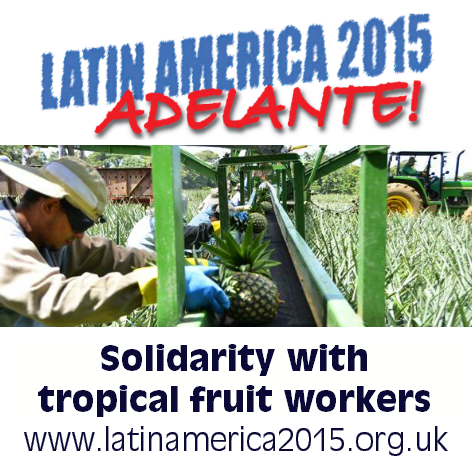 The Latin America 2015 Conference brings together political leaders, trade unionists, NGOs, academics & progressive movements to explore recent developments across the region, along with films, music and exhibitions showcasing Latin American culture. As well as Noé, other speakers at the conference will include William Blum, author ‘Rogue State’ & ‘America’s Deadliest Export’, Veronica Rojas, Nicaraguan Government Vice Minister, the Ambassadors of Argentina, Venezuela, Cuba, Chile, Bolivia and Nicaragua, Jeremy Corbyn MP and Ken Livingstone. Noe's visit has been funded by Unite, UNISON, GMB, UCU and Aslef. 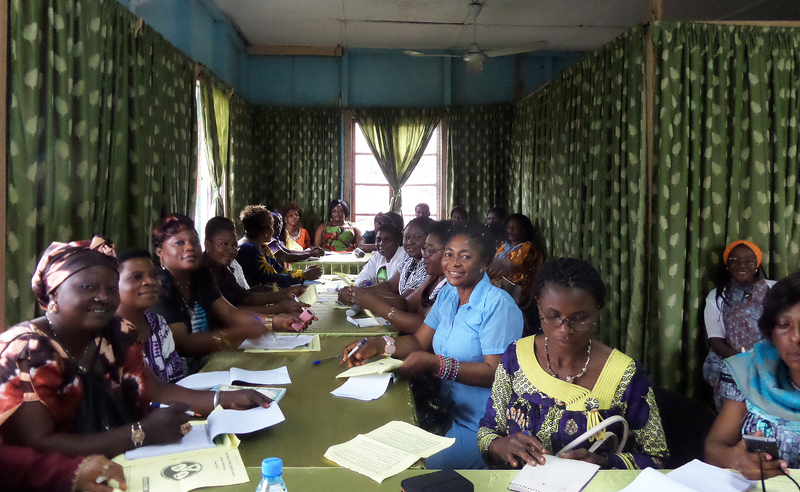 In late August, Banana Link enabled a trade union educator to visit Cameroon to deliver training to more than 50 women workers from various plantations, whose membership of the Fako Agricultural Workers' Union, (FAWU), ranged from newly associated to 24 years. The focus of the workshops was to identify barriers to women becoming union representatives, to share potential solutions, and to discuss the benefits of creating a Women's Committee within the union. FAWU held its Congress in October and has formally implemented amendments to the Constitution to incorporate a Women's Committee into the union structure! In addition, seven women have been elected to the FAWU Board, representing 40% of elected members, including a newly appointed Women's Committee President. In Ghana, as part of Banana Link's coordinated project to secure Decent Work in Africa, trade union education has been delivered this summer to more than 950 members of the General Agricultural Workers' Union of Ghana, (GAWU), including 313 women workers. At least 60% of participants subsequently said they understood the importance of forming women's and health and safety committees in the union. Banana Link is currently fundraising to continue education programmes for women workers and union representatives of FAWU in Cameroon. If you have not donated and would like to support our work you can DONATE HERE. Copyright © 2015 Banana Link, All rights reserved.